This graph depicts the franchise value of all National Football League teams in 2018. The Dallas Cowboys franchise has a value of 5 billion U.S. dollars. The Dallas Cowboys, five-time Super Bowl champions and one of the most successful teams in the NFL, is the most valuable franchise in the league. In 2017, the Cowboys’ franchise was valued at 4.8 billion U.S. dollars, whereas the average franchise value in the NFL was about two billion U.S. dollars. That same year, the Cowboys generated 700 million U.S. dollars in revenue, the most of all NFL teams. The franchise also ranks third in the list of most valuable sports team brands worldwide, just behind the New York Yankees and the Los Angeles Lakers. The Boston-based New England Patriots is the second most valuable franchise in the league, valued at 3.7 billion U.S. dollars in 2016. The four-time Super Bowl champion is amongst the highest grossing teams in the league as well, as the Pats’ revenue amounted to 523 million U.S. dollars in 2015. The New York Giants rounds out the top 3 most valuable franchises in the NFL. The Giants, valued at 3.1 billion U.S. dollars in 2015, like the Pats and the Green Bay Packers, have four Super Bowl titles (1986, 1990, 2007 and 2011). 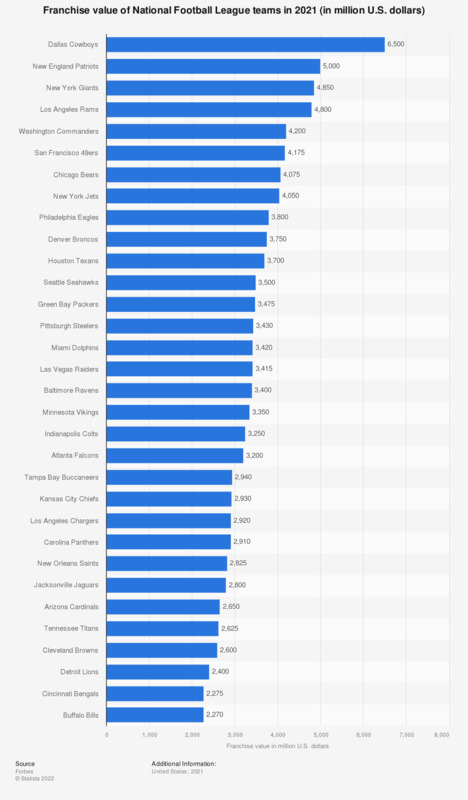 The New York-based team has the highest average ticket price in the NFL – 123.4 U.S. dollars as of 2015. The Giants rank fifth in terms of revenue. In 2015, the franchise’s revenue stood at 444 million U.S. dollars, behind the Cowboys, the Pats, Washington Redskins and San Francisco 49ers. Everything On "Atlanta Falcons" in One Document: Edited and Divided into Handy Chapters. Including Detailed References. Statistics on "National Football League"
Do you follow professional football (NFL)? Would you describe yourself as a fan of professional football (NFL)? Which team is your favorite team in the NFL? Which team do you dislike the most in the NFL? How satisfied are you with the National Football League’s handling of 'Deflategate'? Do you approve or disapprove of NFL Commissioner Roger Goddell’s decision to maintain the four game suspension of New England Patriots Quarterback Tom Brady? How closely do you follow the National Football League?